More than thirty years after disbanding in 1980, Led Zeppelin continues to be celebrated for its artistic achievements, broad musical influence, and commercial success. The band's notorious exploits have been chronicled in bestselling books; yet none of the individual members of the band has penned a memoir nor cooperated to any degree with the press or a biographer. 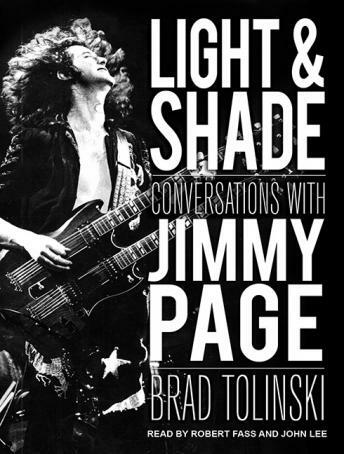 In Light and Shade, Jimmy Page, the band's most reticent and inscrutable member, opens up to journalist Brad Tolinski, for the first time exploring his remarkable life and musical journey in great depth and intimate detail.Based on extensive interviews conducted with the guitarist/producer over the past twenty years, Light and Shade encompasses Page's entire career, beginning with his early years as England's top session guitarist when he worked with artists ranging from Tom Jones, Shirley Bassey, and Burt Bacharach to the Kinks, The Who, and Eric Clapton. Page speaks frankly about his decadent yet immensely creative years in Led Zeppelin, his synergistic relationships with band members Robert Plant, John Bonham, and John Paul Jones, and his notable post-Zeppelin pursuits. While examining every major track recorded by Zeppelin, including 'Stairway to Heaven,' 'Whole Lotta Love,' and 'Kashmir,' Page reflects on the band's sensational tours, the filming of the concert movie The Song Remains the Same, his fascination with the occult, meeting Elvis Presley, and the making of the rock masterpiece Led Zeppelin IV, about which he offers a complete behind-the-scenes account. Additionally, the book is peppered with conversations between Page and other guitar greats, including his childhood friend Jeff Beck and hipster icon Jack White.Through Page's own words, Light and Shade presents an unprecedented first-person view of one of the most important musicians of our era.